The Modern Printing in the Home and For Business looks at the development of printing from its earliest invention to 3D printing today. It also looks at and explores the use of the most common printers in the home and business today, laser printers and inkjet printers. 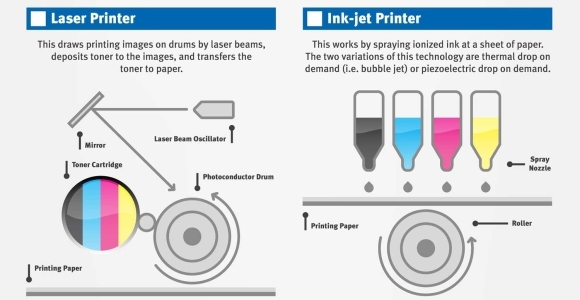 This also includes how inkjet printers work, how laser printers work and how toner cartridges print on a page. There is a lot of debate around the world on ink cartridges so we take a look at the topical issue of genuine ink cartridges vs compatible ink cartridges and remanufactured ink cartridges. There are strengths and weaknesses for each and cost is not the only issue that should be considered. With the cost of electricity rising and the need to reduce waste and reduce our carbon emissions to improve ourselves as citizens of this earth, we look at the issue of global warming and the contribution printing makes to this and also what we can all do to try and reduce both carbon emissions and recycle our printer consumables and hardware. RetailBlue.com is an online retailer of computer parts, ink and toner cartridges, printers and other computer hardware and parts in Australia.